Throat cancer occurs when there is an abnormal growth and proliferation of cells in the throat. Metastasis - indicates whether the cancer has metastasized or spread to other body parts such as the lungs, brain and bones. By combining these 3 criteria, doctors determine the stage of the cancer. The image on the left shows the throat, specifically the pharynx. The image in the middle is the front view of the back of the throat. The last image is an enlarged version of the middle image. The encircled area is the section with the tumor in stage 0 (carcinoma in situ). Stage 0 throat cancer describes the very early stage of cancer, which indicates that the tumor cells are found only in a single tissue layer (Tis), and have not spread to the lymph nodes (N0) or distant organs (M0). Stage I describes a small-sized tumor (T1). There is no spread of cancer cells to lymph nodes (N0) or to distant organs (M0). Early stages of throat cancer, which are confined to the surface, may be surgically treated using endoscopy. Special surgical equipment or a laser may be inserted through the scope to scrape off, cut out, or vaporize using laser superficial tumors. 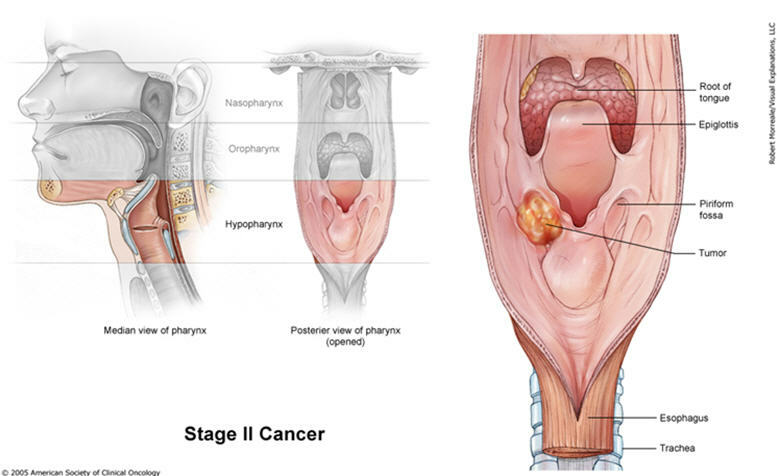 Stage II describes an enlarging tumor, which is starting to spread to nearby areas (T2), but has not spread to the lymph nodes (N0) or to distant body parts (M0). For early stages of throat cancer, doctors may perform radiation therapy, which is often the only necessary treatment. Radiotherapy uses high-energy particles, like X-rays, to kill cancer cells. These particles may be delivered using a large machine (external beam radiation) or from small radioactive seeds and wires placed inside the body, near the tumor (brachytherapy). Treatment of small throat cancers may also involve removal of a part of the throat during surgery. These parts may be reconstructed to allow for the normal swallowing of food. 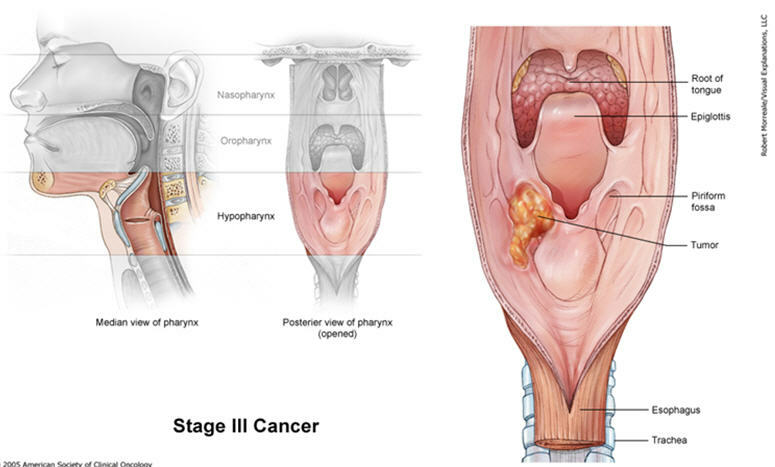 A person with Stage III cancer has a larger tumor (T3), but with no spread to lymph nodes (N0) or distant areas (M0). It may also describe a smaller tumor (T1 or T2), but with cancer cells that have spread to regional lymph nodes (N1), although there is no sign of metastasis or spread to spread to distant areas (M0). Surgery may be performed to remove a part or the entire throat, which usually includes excision of the voice box (larynx) as well. Reconstruction of the throat may be done to facilitate the swallowing of food. Aside from surgery, chemotherapy may rely on chemicals to kill cancerous cells. Chemotherapy is combined with radiation therapy to make cancer cells more sensitive to radiotherapy. However, this combination therapy increases the risk of side effects from both treatments. Another treatment option is using targeted drugs to alter cancer cell growth. Cetuximab (Erbitux) is a drug that is used to stop the action of a protein in certain types of throat cancer cells. Targeted drugs may be combined with chemotherapy or radiotherapy. 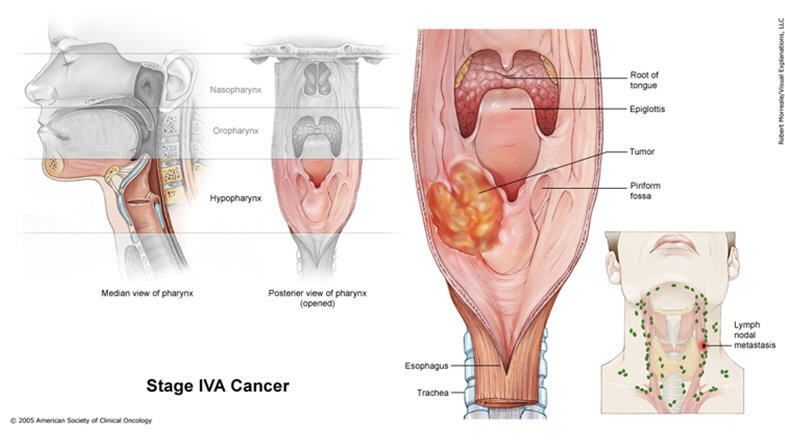 When the tumor has enlarged and invaded other nearby tissues (T4a) and has either spread to lymph nodes on the same side of the tumor (N1) or has not, the cancer is Stage IVA. Other tissues that may be invaded by the tumor include the thyroid, the esophagus, and nearby blood vessels. However, this can also describe any tumor size (any T) with significant cancer spread to lymph nodes (N2), although there is no metastasis yet (M0). The image on the far right shows lymph node involvement. Treatment of advanced throat cancers may involve chemotherapy, radiotherapy, surgical removal of lymph nodes through neck dissection, and tumor removal surgery. 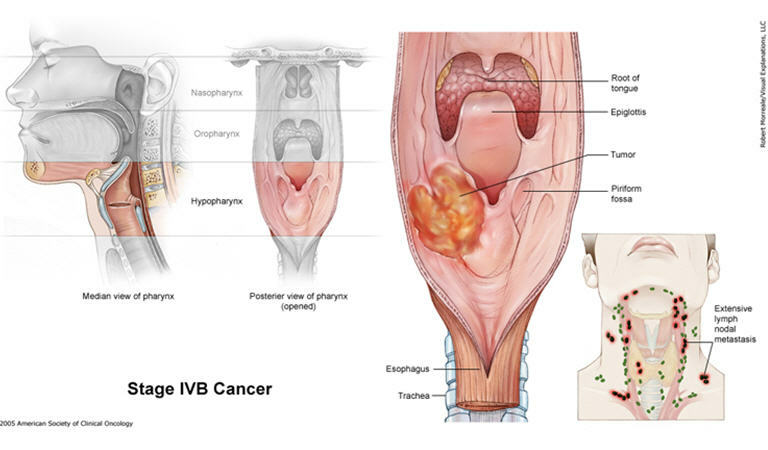 Any tumor (any T) that has extensively spread to the lymph nodes (N3), as shown by the image on far right, but does not involve other organs (M0), is classified as Stage IVB. 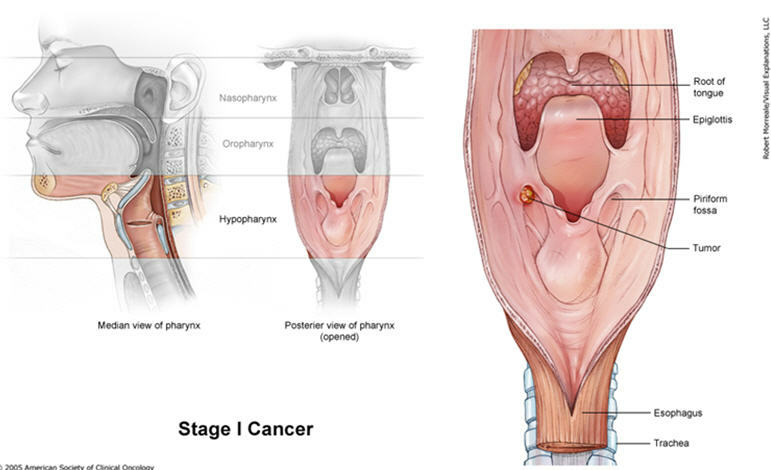 For cancer of the larynx, this stage indicates a very advanced, localized tumor (T4b), which may or may not involve the lymph nodes (any N), but does not involve metastasis (M0). 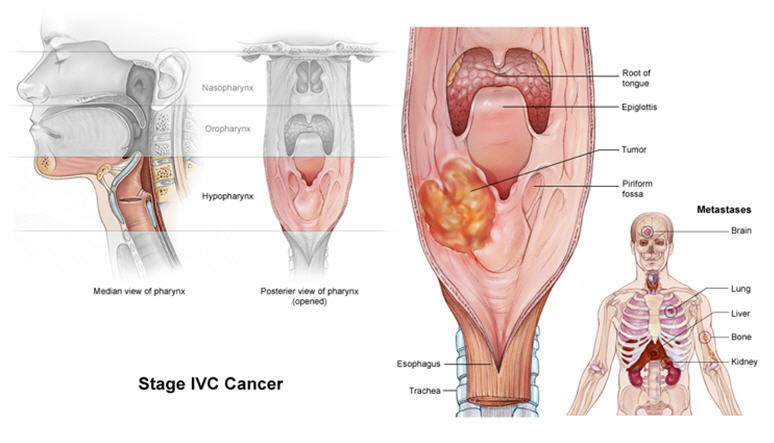 Cancer is at Stage IVC when there is evidence of distant spread to other organs, regardless of tumor size and lymph node involvement. The illustration at the far right shows common sites of metastasis including the bone, lungs, kidney, liver, and brain. This stage carries a grave prognosis, because cancer cells have been carried through circulation to distant parts of the body.